There are hundreds of pieces of music that can be played backwards – so-called palindromes. But nobody has ever seen a long-playing record that plays backwards. Until now that is! The present LP is Tacet’s latest production – a company that is always good for surprises regarding recording techniques. Unlike a 'normal' LP the needle is put down at the lead-out groove and moves outwards. Behind this apparent gag is nothing other than the wish to achieve the very best sound possible with the general awareness that music often begins softly and ends loudly. A great pity that this phenomenon is not taken into account when employing the usual cutting technique, for the further the pick-up arm moves towards the centre, the more information has to be stored per groove centimetre with a constant revolution speed. The result: with an increasing level of sound the high notes tend to suffer from distortion. 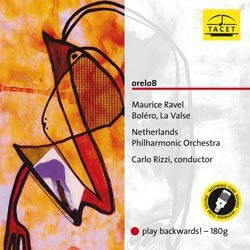 In order to demonstrate that this undesirable effect can be compensated, the director of Tacet, Andreas Spreer, chose to put Ravel’s Boléro – one of the direst examples of dynamics – to the test. The result is 16 minutes of excitement and brilliant sound, which escalates with every millimetre that the needle progresses along the groove to its final climax.